Length N/A 37" 37.5" 37.5" 38"
This is a women’s mini dress that can take you through your autumn days in high fashion. It features an expertly-fitted bodice that buttons up the front. A small standup collar rests at the neckline. The sleeves are three quarter length and end just beneath the elbows with wide cuffs. 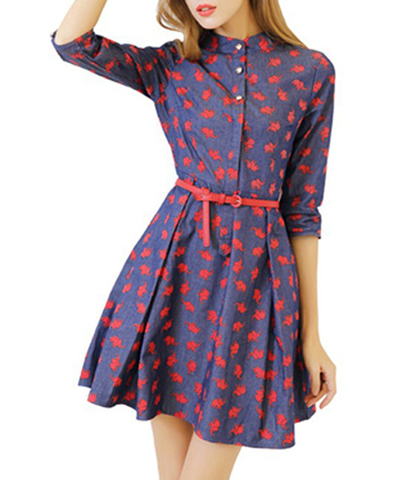 The waistline is defined by a narrow belt in coral, that matches the cotton print fabric of blue and coral. The dress is very short, with the hemline ending well above the knees. This is a machine washable dress. It is available for purchase in sizes Small, Medium, Large and Extra Large.